I warmly welcome you to Chipping Sodbury School. We are an ambitious and forward thinking school with a culture and ethos embedded in our four core values of respect, integrity, responsibility and aspiration. We aim to inspire our young people to achieve high standards in all aspects of life. Effort and a positive attitude to learning are qualities we strive to nurture. We are ambitious for all our young people and recognise each individual is unique and has particular strengths and talents. All students should feel successfully engaged in their learning and have an entitlement to learn in a safe, stimulating, inclusive environment supported by highly committed and motivated staff. The school community is determined that students achieve their potential and are fully equipped for adult life. Standards of behaviour are very high and our excellent student support structure enables us to get to know each individual. We enjoy strong partnerships with our parents/carers and our local primary schools. By working together, we can support each individual student and enable them to thrive. As a parent and Headteacher, I appreciate that making the right choice of secondary school is a crucial decision. To visit our school is to experience a warm, enthusiastic and engaged community; you are welcome to do so at any time. The school has its own Sixth Form Centre. We work in partnership with Brimsham Green School and Yate International Academy to form the Cotswold Edge sixth form. This collaboration allows us to offer a wide range of courses, both academic and vocational. 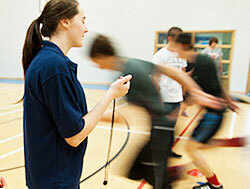 Sixth form students take on other responsibilities and act as role models for younger ones. A strong support team provides information and guidance to students to help make decisions that are right for them as they move from school into university or employment.